Totally cute since she’s only in grade nine, but I did make sure to take a few minutes out of my day to pray for her exam. 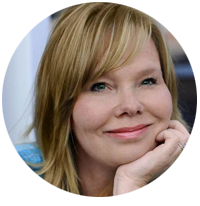 This sudden interest in prayer is new and alive in her. I love to watch how it’s constantly on her mind, and that she’s taking both the little things and the big things to prayer. Most of all I love that it’s more than a ritual or a last resort–it’s a passion. I love that, “Prayer is a nuclear weapon.” If more couples prayed together, less couples would struggle. If more couples were united in faith, less would step out of their marriage. Don’t get me wrong. I’m well aware that the divorce rate is just as high among Christians as it is among non-Christians. But I have to wonder how many of those couples were united in prayer–together–seeking the will of the Lord for their marriage. Being a Christian doesn’t mean that your marriage will be stronger than anyone else’s, but when Christ is put at the center of that marriage it does. There’s a popular graphic that many of you have probably seen before. It’s called the marriage triangle. 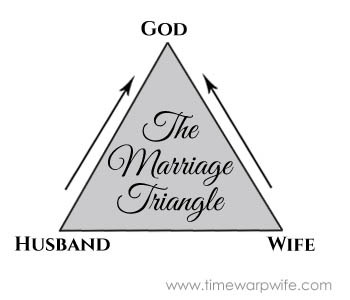 The triangle illustrates how a husband and wife who are focused on the Lord will naturally grow closer together. Mathematically speaking it would make more sense for the man and wife to take the easy road, wouldn’t it? To come together on the bottom line? Each person travels half the distance and there’s no uphill climb. Easy peasy. It’s a fact however that a triangle is much stronger than a single line ever could be in fact it’s even stronger than a rectangle. So it is with life. So many couples would rather travel half the distance and put in a fraction of the effort it takes to make a good marriage work. And fewer yet put God at the center of marriage. My vow today is to pray for my marriage, and I know that Michael is praying the same. For those of you who are alone in this–whose husbands aren’t seeking the will of God for your marriage I remind you of this: don’t underestimate the power of prayer or consider it your last resort. The power of prayer is a dynamic force. Maybe you’ve come to a place where you feel like there’s nothing else that you can do. Pray. You can’t change the heart of a man, but the same God who hung the sun and the moon in the sky certainly can! P.S. Come back here on Monday for week 3 in our “Revive Your Marriage” series. We’ll be talking about intimacy, and you won’t want to miss it! Just a reminder. Our challenge this week is this: make a conscious habit to pray for your marriage throughout the day. Take time here and there to commune with the Lord and bring your husband before Him. R – Read Daniel chapters 5-6. Also, read Psalm 5. E – Expand on questions you might have as you’re reading (dig deep and take notes). A – Ask yourself how you can apply this scripture to your marriage. D – Decide if there are any changes you need to make or actions you need to take. The story of Daniel is a great fit for this week as we see him praying to God three times a day. He’s a prime example of someone who believed in the power of prayer. We see that he valued prayer more than he did his own life, which is what makes his story so incredible. I’ve also included a Psalm because it’s a beautiful focus for this week as we’re offered a glimpse into the prayer life of David. Darlene Schacht and her husband Michael live in Manitoba Canada where the summers are warm and the winters are cold. Together they’ve come to learn that relationships aren’t always easy, but that marriage, the way God intended it to be, is a treasure worth fighting for. You just finished reading Marriage Challenge – Revive Your Prayer Life Pt. 2! Consider leaving a comment! The post Marriage Challenge – Revive Your Prayer Life Pt. 2 appeared first on Time-Warp Wife.